Хочу поделиться еще одной адаптированной книжкой для уровня beginner — elementary. Жанр: история со счастливым концом. Написана очень легко и так же, легко читается. Вся лексика очень простая и в тоже время нужная для разговорной речи. 19 вордовских страниц, 3550 слов. Кому надо, ссылка на скачку книги с яндекс диска в конце статьи. Начинающим и не только, советую прочитать книгу 2-3 раза вслух. Это займет 15 минут вашего времени. I remembered Jims description of the woman who made her. How could a woman like that make a beautiful doll? My name is Stephen Amony and I am a doctor. I live and work in London, and I have a house by the river Thames. Everything in this story happened because of a doll. It is a strange story, but true. I can remember it clearly. The early morning sun was shining on the river when I left my house. I went to buy a copy of The Times, as usual. There was a flower shop on the corner of the road where I lived. I could see the brightly-coloured flowers as I reached the corner. I turned into Abbey Lane and continued walking. I was enjoying the warm October sun. After a few minutes, I arrived at the newspaper shop. Suddenly, I remembered that it was a niece’s birthday the next week. So I stopped and looked in the shop window. There were games and toys, paper and pens, books and sweets in the window. ‘Most of it has been in that window for years,’ I thought to myself. I almost decided that there was nothing in the window for my niece. Then I saw a doll. She was half-hidden in the corner of the window. She was made of cloth and she had a painted face. The face was special. It had a lovely gentle look, but sad eyes. Suddenly I felt sorry for her, sitting in that crowded window. I know that this sounds strange. But I decided to go inside and to look at her more closely. The shop was owned by a man named Jim Carter. ‘The one that’s half-hidden in the corner,’ I said. ‘Can I see her?’ I said. ‘She’s also very expensive,’ he said. He took the doll from the window and gave her to me — and I nearly dropped her in surprise. She was beautifully made — she seemed almost alive! Her dress and other clothes were hand-made, not made by a machine. And her face was hand-painted — I could see it clearly now. I could see this love in the doll’s face. I put her down gently. ‘What’s her name?’ I asked. ‘What’s she like?’ I said. I couldn’t understand this. 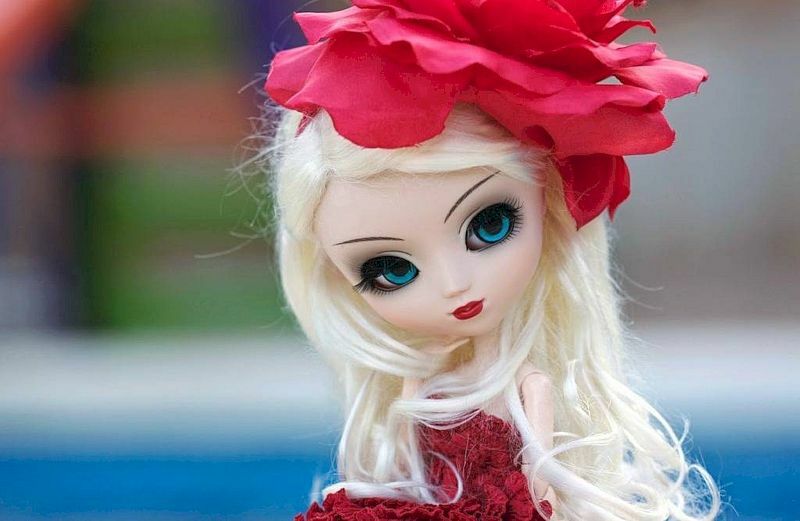 How could a woman like that make dolls as beautiful as these? ‘I’ll buy the doll,’ I said at last. Eleven pounds seemed a lot of money for a doll. As I counted out the pound notes, I felt a little silly. Yes, the doll was a present. But I knew the real reason for buying her — I didn’t want to leave her in that shop window. I took the doll home and put her in my small bedroom. She seemed to fill the room with her loveliness. I carefully put her into a box. Then I covered the box with brown paper. Later, in the afternoon, I went to the post office and posted it to my niece. In the following days, I could not stop thinking about the doll, or about the gentle face and the sad eyes. I remembered Jim’s description of the woman who made her. How could a woman like that make a beautiful doll? It was difficult to believe. So who was she? I wanted to know, but the weather got cold and wet. Children in the area became ill, and I was suddenly very busy. I soon forgot about the woman — and the doll. ‘Yes, it is,’ I said. ‘Do you visit people who can pay for your visit?’ the woman asked. ‘How much does it cost?’ she asked. The woman seemed to think that money was more important than the sick person. ‘A visit will cost five pounds,’ I replied. ‘But if you really can’t pay, then I don’t ask for the money,’ I said. ‘What’s your name?’ I asked. ‘I’ll be there soon,’ I told her. I arrived at the house next to the cake shop in Hardley Street ten minutes later, and went up the stairs. They were narrow, dirty, and badly lit. As I reached the top of the stairs, a door opened. ‘Doctor Amony?’ said the unpleasant voice. She was a tall woman, between forty-five and fifty years old. She had red hair, dark eyes and a bright shiny-red mouth. We went into the front room. It was a cold, ugly room, and the furniture was cheap and badly made. On the cupboard in the corner were a lot of small glass bottles. Then I saw the dolls. They were hanging from the walls and were thrown carelessly across the bed. Each doll was different, but each one was as beautiful as my doll. It seemed impossible that this rough, unpleasant woman could make them. Rose Callamit looked closely at me. ‘You’re a very young doctor,’ she said. Before we went in, I had to know about the dolls. ‘Do you make these dolls?’ I asked. I felt very sad. ‘I bought one for someone’s birthday,’ I said quietly. She laughed. ‘And I’m sure that you paid a lot of money for it,’ she said. She took me to a smaller room at the back and started to open the door. ‘Mary, it’s the doctor!’ she shouted. Then she pushed the door open wider to let me in. The girl, Mary, was sitting in a chair by the window. She heard the woman’s words. A look of unhappiness crossed her pale face, and there was pain in her large dark eyes. I was angry at the red-haired woman. The words were unnecessary. She wanted to hurt the girl. Mary was not more than twenty-five years old. But I could see immediately that she was very ill. I looked again into those dark eyes. ‘Something inside her is dying,’ I thought. After that first visit I always remembered the sweetness in her sad face, her poor, thin body and her dry, unhealthy hair. But something filled me with happiness. Around her were three small tables — and on them were all the necessary things to make the dolls! Brightly-coloured paints, and pieces of cloth of many different colours and shapes. I soon understood that her twisted leg was not the reason for her illness. I noticed the way that she sat. If I was right, I could make that leg straight. I was almost sure that I was right. ‘Can you walk, Mary?’ I asked after a minute. She looked at me, then looked away. ‘Yes,’ she answered, quietly. Please walk to me,’ I said, gently. I didn’t want her to suffer. But I had to be sure that I was right. She got up from her chair very carefully and moved slowly towards me. I looked closely at her left leg. Yes, I was right! «That’s good,’ I said. I smiled at her. I wanted to show her that I was pleased. I held out my hands to help her. She looked up. Again, I saw the pain and hopelessness in her face. She seemed to be crying out silently to me for help. She lifted her hands towards mine — and then they fell back to her sides. ‘How long have you been like this, Mary?’ I asked. When I finished my examination of Mary, I went with Rose into the front room. I jumped. ‘That’s enough! You must never say anything about that to her. The best doctors cannot help her. No stupid young man is going to give her hope. If you ever do, you won’t come here again. I was ready to leave. I picked up my bag. ‘I thought that you made them,’ I said. I walked out into the bright October sunshine. I knew that Rose Callamit was lying. I now knew the sweet person who made those special dolls. I was happy about this, but I was also worried about Mary. I had to discover what was wrong with her. I had to know before she died. ‘Without Mary and the dolls, the money will end.’ But what was killing Mary? I still did not know. I discovered more about Mary during my next few visits. Her name was Mary Nolan. When she was fifteen years old, she was in a bad car crash. Her mother and father were killed and Mary was very badly hurt. The car crash was the reason for her twisted leg. Rose Callamit offered to look after Mary. The law finally agreed because there was no other person to look after the young girl. Rose always thought that Mary s father was a rich man. Then she learned that there was only a small amount of money. After that she was unkind to Mary. She made her very unhappy. The years passed, and Mary began to believe her aunt. She stayed with her. She did what her aunt wanted her to do. She could see no reason to leave her aunt. So she lived an unhappy life, without hope. Then Mary started to make the dolls. Rose Callamit saw how lovely the dolls were. She soon realized that she could sell them for a lot of money. She was right. After she sold a few, she decided. Mary must work on them every day of the week, from morning until night. But what was killing Mary? I still did not know. I could see that she was afraid of her aunt. But it wasn’t that. And I couldn’t ask Mary, because her aunt was always with us. Mary found it difficult to say anything to me with Rose in the room. I did not tell Mary that perhaps I could make her leg straight. It was more important to discover why she didn’t want to continue living. I told Mary to stop working on the dolls, and I brought her some books and some chocolates. For ten days she seemed to get better. During my next visit, she smiled at me for the first time. ‘That’s better!’ I said. I was very pleased to see her happy face. But I could see that Rose was unhappy at these words. When I called again, she was waiting for me in her room. ‘You don’t need to come any more, Doctor Amony,’ she said, coldly. ‘But Mary must not-‘ I started to say. My eyes went to the box in the corner of the room. There were three new dolls lying on top of it. Their faces were as lovely as ever, but they had the look of death on them. Suddenly I was frightened for Mary. I knew that Rose Callamit was lying. I wanted to push this woman out of the way and crash through the door and see Mary. But I was a doctor. When doctors are told to leave, they have to go. I still did not know what Mary’s problem was. But I guessed that Rose was asking another doctor to call. So, sadly, I left. But I couldn’t forget Mary. I continued to worry about her in the days that followed. Not long after this I became ill. It wasn’t much at first. But as the days passed it seemed to get worse. I visited a doctor friend. But I knew that this wasn’t the reason. I continued to get worse. I didn’t want to eat and I lost weight. I began to look thin and pale. I felt tired, but I didn’t sleep well at night. I sometimes dreamed that I saw Mary. She was calling to me for help, while Rose Callamit was holding her in her ugly arms. I thought about Mary all the time. ‘I wasn’t able to help her,’ I thought. One night I couldn’t sleep at all. I walked up and down my room, thinking about myself and my illness. It seemed that I was suffering from the same illness as Mary. Suddenly I knew what was wrong. I was in love with Mary Nolan! And because I couldn’t look after her, I felt ill and unhappy. ‘I know why Mary’s dying!’ I thought. ‘She’s dying because nobody loves her. Nobody in the world is giving her hope for the future. Her mother and father are dead. Her aunt only keeps her because she makes money from Mary’s dolls. Mary has no friends and she feels ugly because of her leg. Her life is empty — except for the dolls. I thought about this all through the night, and the next morning I telephoned Jim Carter at his shop. ‘Yes, of course,’ said Jim. I was worried about a telephone call while I was out. So each evening I put my head round the door of his shop. But he just shook his head. There was no news. Then one day, at five o’clock in the afternoon, the telephone rang. It was Jim. I ran to the house where Mary lived. When I got there, I ran up the stairs. Luckily, the door was not locked, and I hurried through into Mary’s room. She looked so thin now, and very ill. She still had the paints and pieces of cloth around her. She looked up when I came into the room. Her eyes opened wide in surprise when she saw me. She thought that it was Rose. But she didn’t call me ‘Doctor Amony’ — she called me ‘Stephen’. ‘Does it matter now?’ she said, quietly. I sat down and held her hand. I was not sure that she could still hear me. But I wanted her to live so much. Then I felt her small hand move in mine and her eyes slowly opened. She seemed almost glad to hear these words. This gave me hope. I talked gently. I tried very hard, because I wanted her to understand. ‘Those dolls were your children, Mary,’ I said. ‘You thought that you couldn’t be a mother. So you made those beautiful dolls. Into each one you put some of your love. You made them gently and carefully, and you loved them like your own children. I finished speaking and she moved. She seemed to understand what I was saying. I saw tears of happiness in her eyes. She smiled and put her arms out to me. I took her up in my arms and she held me. I put my coat round her to keep her warm. Then I carried her across the room. Suddenly we heard the front door shut and the sound of running footsteps. Then Mary’s door crashed open as an angry Rose Callamit came into the room. Mary started to shake with fear. She hid her face in my neck. But Rose was too late. She could do nothing now, and she knew it. She did not speak a word when I walked past her. I held Mary close to me. I went out of her front door, down the stairs and into the street. Outside, the sun shone and the sky was blue. Children played happily and noisily in the street as I carried Mary home. As I write this, Mary is playing with our son. Our second child will arrive in a few weeks. Mary doesn’t make the dolls now. She doesn’t need to make them. But I silently thank the day when I first fell in love with the beautiful doll in Jim Carter’s shop window. Скачка с яндекс диска >> если читать онлайн не совсем удобно. Очень милая история. Прочла с удовольствием. Самое то для моего уровня.